A lead weight hollowed out at the bottom is fitted to a lead line, so that it may be armed with tallow, this allows the nature of the bottom to be ascertained when a lead line is used by a seaman to find the depth of water when a ship is navigating in restricted or shallow water. 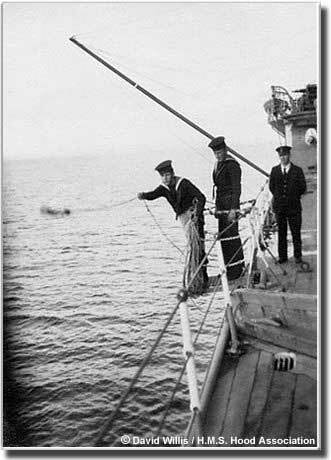 The lead line is a length of rope up to 50 fathoms long, ( a fathom is the term for 6 feet ) and this line is fitted to the lead weight, hence the expression "To heave the lead" which means to use a lead line line to find the water depth. This should not be confused with the term " Swinging the lead" which is used to describe a sailor who is lazy. 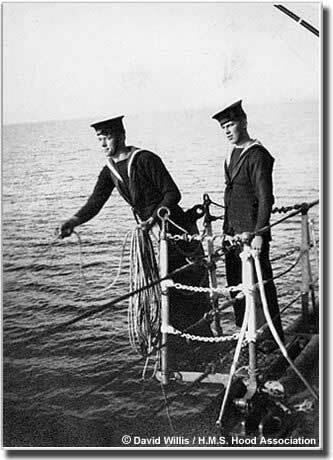 On either side of a ship about adjacent to the bridge there is a small platform, with protective chain on three sides connected to small stanchions these e are known as "The chains"
On entering or leaving harbour, or in restricted waters a seaman mans the starboard chains, he holds the lead line coiled in his left hand, and takes a length of the line in his right hand, with the lead weight secured to its end, he swings this line in an arc over his head several times, letting it go on the forward swing. As the ship moves forward and the lead line is vertical, he reads the depth showing on the line just above water level, and calls out this depth in a loud clear voice. 2 fathoms from the lead - 2 strips of leather. 3 fathoms from the lead - 3 strips of leather. 5 fathoms from the lead - a piece of white cloth. 7 fathoms from the lead - a piece of red cloth. 10 fathoms from the lead - a piece of leather with a hole in it. 13 fathoms from the lead - a piece of blue cloth. 15 fathoms from the lead - same as for 5 fathoms. 17 fathoms from the lead - same as for 7 fathoms. 20 fathoms from the lead - small line with 2 knots. 25 fathoms from the lead - small line with 1 knot. 30 fathoms from the lead - small line with 3 knots. 35 fathoms from the lead - small line with 1 knot. 40 fathoms from the lead - small line with 4 knots. Pictures are from The Willis Photo Collection.